Home News Tiger Woods Hails Success Of Inaugural Celebrity Cup. Tiger Woods Hails Success Of Inaugural Celebrity Cup. 2 months ago by Fatiha Betscher Comments Off on Tiger Woods Hails Success Of Inaugural Celebrity Cup. 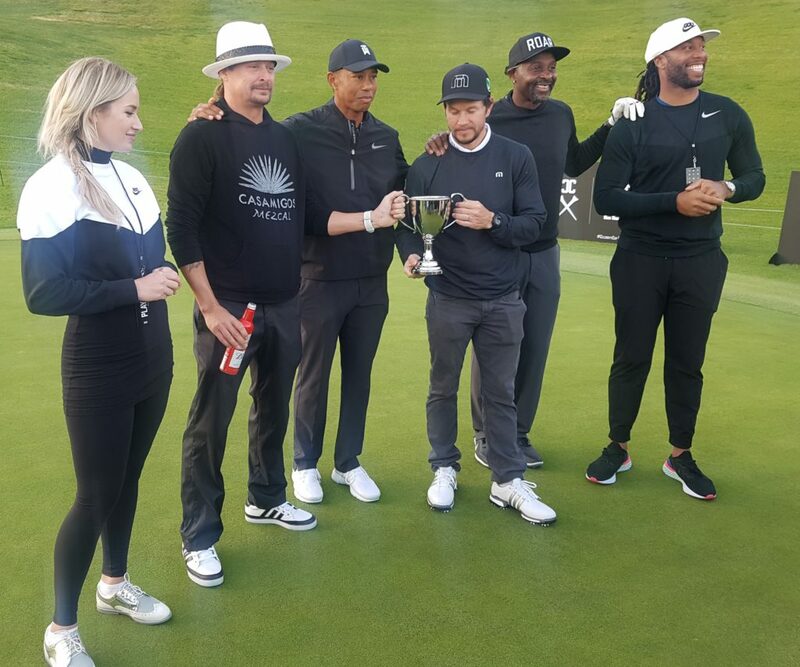 Tiger Woods hailed the success of the inaugural Celebrity Cup that took place Monday afternoon over nine-holes of the Riviera Country Club course and venue for Thursday’s starting Genesis Open. Woods and long-time good friend, Fred Couples acted as non-playing captains of a five-person team of celebrities. Among the stars was Hollywood superstar, Mark Wahberg, fellow actor Chris Pratt, NFL greats Reggie Bush, Jerry Rice and Larry Fitzgerald who each played on Woods team, along with TV game show host, Chris Harrison, actor Oliver Hudson plus singer, song-writer and actor, Nick Jonas. Also in the field was singer-songwriter’s, Kid Rock and Luke Wilson. Lone female, Paige Spiranac was the only female in the competition. In the end it was Woods’ team of Wahberg, Bush, Fitzgerald, Harrison and Spiranac. “It was a very special day and we were so lucky with the weather as conditions were perfect,” said Woods. “So, to get the event played on a day like today was great. “We have been planning this event for a few month now and just trying to get all these big celebrities to understand what we are trying to do and for them to give-up their time. Golf-mad Wahberg is no stranger to the PGA Tour and has been a regular competitor in the AT & T Pebble Beach Pro-Am though he skipped last week’s event. “It was great fun and it was good we played just nine-holes as we had a great time,” said Wahberg. “There was a lot of great people all for a good cause and Tiger’s just amazing what he does and to have joined him today was just awesome. “Everyone knows how much I love golf and how much time I spend on the golf course, and I love the team-format of golf. In fact, I was actually trying to get to Paris last year for the Ryder Cup but I have to work for a living so I just couldn’t make it.